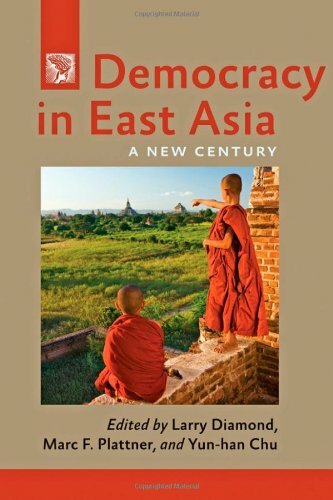 In their introduction to the 1998 edition of Democracy in East Asia, Larry Diamond and Marc F. Plattner predicted that East Asia, with its remarkable diversity of political regimes, economies, and religions, would likely be the most critical arena in the global struggle for democracy, a prediction that has proven prescient. Although the recent political upheavals in the Middle East have understandably grabbed the world’s attention, there is reason to doubt whether the overthrow of some authoritarian regimes there will lead to the establishment of stable democracies any time soon. On the other hand, East Asia, the world’s most populous and economically dynamic region, already boasts several consolidated democracies and provides a fascinating laboratory for studies of both authoritarian resilience and the prospects for democratization. This updated volume, which features contributions by distinguished scholars in East Asian studies, will be welcomed by instructors and students in the field, particularly as U.S. foreign policy is in the process of undertaking a “pivot” toward Asia. Larry Diamond is senior fellow at the Hoover Institution and the Freeman Spogli Institute for International Studies at Stanford University, where he directs the Center on Democracy, Development, and the Rule of Law. Marc F. Plattner is vice president for research and studies at the National Endowment for Democracy. Plattner and Diamond are coeditors of the Journal of Democracy. Yun-han Chu is Distinguished Research Fellow at the Institute of Political Science at Academia Sinica in Taipei and professor of political science at National Taiwan University.